Antigua Guatemala (76.6 km ENE from epicenter) [Map] / MMI V (Moderate shaking): My daughter and I were sitting in a restaurant, in the interier garden, in downtown Anitugua. Floors shook and it was a bit unsettling in light of the recent volcano erruption in June. Guatemala City / MMI III (Weak shaking): I was in a car and we just rocked alittle. (90.7 km ENE from epicenter) [Map] / MMI IV (Light shaking): I was resting in a couch indoors when I felt it, saw some hanging lamps moving. 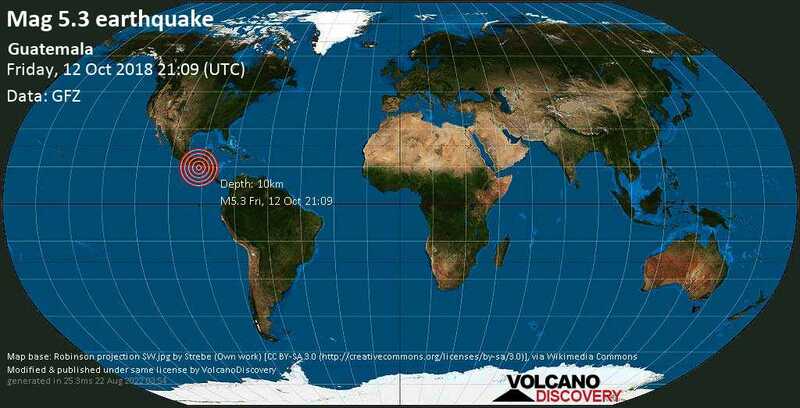 Antigua / MMI V (Moderate shaking): I was in my car and felt a whole lot of shaking going on. It has been a windy day and I think that's what it was. Guatemala City (101.1 km ENE from epicenter) [Map] / MMI V (Moderate shaking): bumpy sensation for a few seconds and then a gentily shake. Nueva Concepción / MMI VII (Very strong shaking): En el inicio se sintieron pequeños movimientos y luego pudo sentirse un fuerte movimiento. panajachel, guatemala / MMI IV (Light shaking): Went on for about 30 seconds. Malacatan / MMI IV (Light shaking): Heard windows shaking and felt movement. Antigua, Guatemala / MMI III (Weak shaking): My first experience in an earthquake. Just enough movement to feel it, some people in the restaurant stood up and began walking out doors. Villa Nueva, Guatemala / MMI V (Moderate shaking): I work in a factory in Villa Nueva and my desk was shaking. Nothing fell over, but it was shaking.